While each of the Dungeons & Dragons settings have their appeal, for my money Eberron tops the list. The Keith Baker-created world, which was introduced in third edition, takes the traditional high fantasy of D&D and tilts it just enough to where it’s a different, unique world that plays on noir and pulp adventure. When Fifth Edition was announced in 2014, fans began clamoring for Eberron’s return. And it finally happened late last summer with The Wayfinder’s Guide to Eberron, bringing warforged, Dragonmarks and the Mournland into the latest edition of the game. It was clear though at that time that Baker wasn’t done. While Wizards of the Coast has yet to officially release or announce additional content for Eberron, they opened it up for creators to make new content on the DMs Guild. Baker has been open about his desire to introduce more content that Wizards might have the time to spend resources on, and since then has begun producing an adventure path for the setting, as well as writing his own content. The latest of those releases, Morgrave Miscellany, takes the cake. Co-designed with Wayfinder’s Guide co-author and Inkwell Society DM Ruty Rutenberg, the 162-page book dives deeper into the world of Eberron with a host of character options, world-building material and everything else that a DM and their players could need to build the best campaign they’re able to. 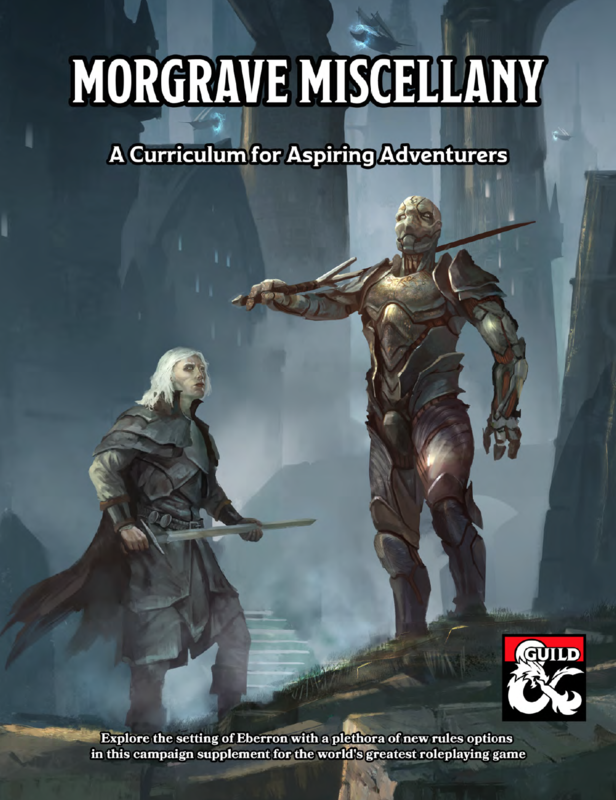 Many players open up a new supplement and jump straight to the system stuff, and for those players Morgrave Miscellany is going to be a delight. The book offers a new archetype for each of the twelve classes, drawn from some of the Eberron prestige classes of earlier editions. There’s everything from Extreme Explorer Barbarians, who run on adrenaline and not rage, to the Wizard School of Antiquities, which use their knowledge of ancient history to give them tactical advantages. In between there are a options that include Monks of the Silver Flame, a new (and terrifying) Warlock Pact, a Paladin oath that harnesses the character’s own divinity and so on. Each of the classes is distinctly flavored to fit perfectly into Eberron, sliding right into the pulp noir fantasy zone with minimal fuss. Races also get a bit more variety here, with some new Shifter and Tiefling subraces. But the big toy in this category is the Dragonforged. Similar to Warforged, they’re creations given life but left adrift in the world. There are also subraces for those with Aberrant Dragonmarks and some new racial feats specific to the Eberron races like kalashtar and changelings, while Dragonmarks get heavil expanded on with new power levels and a lot of new information on Aberrant marks. The new character options are thematically appropriate, but how do they play? I have not had a chance to test them out yet, obviously. But the short answer is that they play much like other Eberron content: with new systems that are intriguing and powerful, yet mostly balanced against the power levels of other Eberron content. Dragonforged are undoubtedly tough, with a very high armor class, but they also have a some narrative aspects that help balance their combat power. Several of the classes introduce the concept of spending hit dice and taking damage from them in order to boost a roll or gain other mechanical benefits, which is the right kind of thematic mechanic for Eberron games. Chapter Three contains a couple of other optional mechanics in Injury Saving Throws (allowing you to stay active when brought to 0 hp at the cost of lasting wounds) and how to play a zero-level campaign that is rewarding and fun for the players. Both of these are interesting options that won’t work for everyone, but they’re balanced nicely and for people who want them, they’re nice bonuses. While mechanics are always appreciated, the real appeal in Morgrave Miscellany is the rest of the content. Baker, Rutenberg and the rest have done a fantastic job in this book of exploring what it means to play in Eberron, and how you can fit traditional character concepts into the world. Eberron is a unique setting and with that comes a lot of potential caveats. It’s one of D&D’s greatest settings, but a lot of players can be uncertain about how to fit within the expansive, somewhat non-traditional environment. For those players, there is a lot to work with here. The book goes through each class and offers ideas for potential concepts set within the power groups, governments and nations of Eberron. Want to play a Barbarian who isn’t all Conan-esque? Try an Eldeen Champion. Have a need to play Cleric but you’re out of ideas for a new one? There are ideas for how to play the class differently using all of the core backgrounds. There’s information on the nomadic halflings of the Talenta Plains, the various faiths and how they play into divine classes and plenty more. And impressively, it’s all written in a way to have value for old hats at Eberron and newcomers alike. It’s not just player options, either. Chapter Three, “Fantasy Noir,” has a ton of great information for Dungeon Masters seeking to strike the right tone of an Eberron campaign. There’s information on running “session zeros” and what noir means in the context of fantasy roleplaying. The final chapter is DM-focused as well, looking at a series of zero-level adventure encounters that fit smoothly within the setting. One of the trickiest parts of the DMs Guild is that you never know what you’re going to get. Nowhere is that more clear than when talking about layout and editing. These are elements that are not necessarily part of the package that makes a great designer of RPG content. Fortunately, this group has a lot of experience with content and things are laid out fairly well. The whole book is laid out like a collection of lectures and lessons from Morgrave University, the somewhat-disreputable college of exploration in the city of Sharn. This allows Baker, Rutenberg and their fellow designers to mesh the flavor nicely in with the mechanics for a text that flows effectively. If there’s anything that earns this a ding, it is that it references material not contained within other official D&D books. It is a very minor quibble, but I don’t yet have the DM’s Guild product Xanathar’s Lost Notes (although it’s next on my list to buy). I don’t begrudge designers the idea of drawing from their other published works for new material, but there is a little disappointment to be had there, however minor. Outside of that a few typos occur here and there, and some rules are not quite worded as well as they could be. But all in all, this is a professionally put-together book thanks to Baker and his team’s editing, with some stellar art to boot. And at 162 pages, $14.99 is a very good price for it. With the addition of the Artificer in the latest Unearthed Arcana and the options here in Morgrave Miscellany, Eberron feels much more like a complete setting for Fifth Edition. Keith Baker, Ruty Rutenberg and their fellow designers have put together a supplement here that gives players an absolute wealth of options and idea for expanding upon and enhancing Dungeon Masters' games. This should be an immediate buy for anyone who has designs on running a game in Eberron.